Focussing goals on what really matters sounds obvious, but it’s actually very hard to do. Theres some stuff we know is really important, and some we know is not important at all. The difficulty comes in stepping away from the things that fit in neither group. Things we have already invested lots of time in and feel a very strong personal attachment to are hard to step away from. It’s actually the biggest challenge that I’ve faced lately, and the reason I needed to take time out to reconsider the multiple projects I had running and the range of possible directions my business could go in. It all came from the realisation that you can move a little way in a hundred different directions or a hundred miles in one direction. I was very definitely going nowhere to lots of different places! So, one of the things that I really wanted from my recent Quarterly Personal Offsite was focus, and deciding what it is that actually matters for the next year. I realised I was trying to do too much, and as a result making very little progress on lots of things. I resolved the issue by listing out everything I’m involved in or trying to achieve. It turned out to be a very long list, around 25 things. I took the list and circled the 5 most important things on it. I’m now trying to manage the next quarter by only focussing on those 5 things. The theory: every hour spent on something at the top of the list will be much more valuable than an hour spent on something at the bottom of the list. It’s a really practical example of using the 80/20 or pareto rule in practice. This sounds simple, but it’s actually extremely difficult in practice. To start with, those 5 things that stay on the list need to be balanced. They aren’t just work goals. They need to be holistic and include personal stuff too so they focus on the most important areas in your life. 5 things is suddenly a very short list. This really does mean saying no to a lot of things and that’s not easy. I’ve written before about saying no to things, but this takes it to a whole new level. One of the biggest decisions, and the hardest, was to drop 4 of the 5 internet projects I’d been involved in and focus on only one. A tough decision because I’ve invested significant time in each of those projects and each one is quite near a significant go live milestone. The decision made more difficult because 3 of the 5 are well worth taking further. All of them involve stuff I’m passionate about. Through the process I was reading a book that really helped. 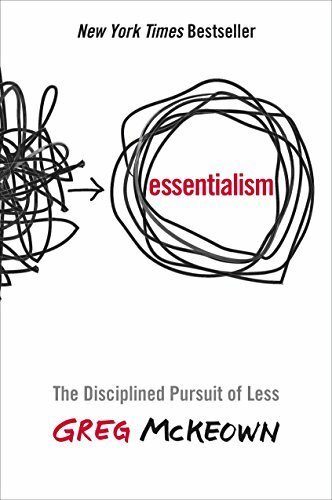 Essentialism: The dedicated pursuit of less by Greg McKeown. Theres a link below, and it’s really worth a read.